"Self-paced instruction or learning is any kind of instruction that proceeds based on learner response. The content itself can be curriculum, corporate training, technical tutorials, or any other subject that does not require the immediate response of an instructor. Self-paced instruction is constructed in such a way that the learner proceeds from one topic or segment to the next at their own speed. This type of instruction is becoming increasingly popular as the education world shifts from the classroom to the internet (Wikipedia)." Self-paced learning is an excellent way for students or educators to learn material at their own pace. Also, this is ideal to help users retain information in a low pressure place as well as supplement different learning styles. 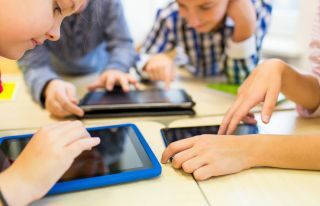 Finally, self-paced learning is becoming more and more prevalent in schools with the integration of BYOD (bring your own device) or mobile learning. *This list is in alphabetical order. Brain Pop & Brain Pop Jr. - One of the most popular sites around for self-paced learning where students can watch animated movies with the robot Moby then answer questions regarding the subject. GrammarFlip - An excellent site for students to practice their grammar by watching educational videos and then completing interactive exercises. Lynda - A great site for online training on a wide range of subjects where users can learn at their own pace. Mathigon - An innovative interactive textbook that lets acts as personal tutor for students that provides instant real-time feedback. Outwhiz - A nice site or app for Math and English grades K-8th. Also, Outwhiz tracks student's progress and lets them learn at their own pace. PBS Learning Media - A wonderful site with an educational portal for students to learn a wide range of subjects at their own pace w/ resources (i.e. videos, lessons) aligned to state-standards. Sentence Builder - An interesting iOS app for ages 4-7 yrs old to learn about sentence structure and grammar in a fun and engaging way. Splash Math - A K-5 Math curriculum and iPad with individual self learning game-based programs for students. UMU - A fantastic site and mobile app (iOS/Android) that can be used for any subject any even professional development. VocApp - A great free mobile app that uses flashcards to help users learn at their own pace and differentiate instruction.